When the temperatures dip and the lakes freeze, anglers turn their thoughts to what is affectionately known as “Hardwater Heaven.” Whole communities of shacks and huts start appearing on the ice-covered waters as anglers drop their lures in search of that hidden lunker. Ice fishing is a time-tested Canadian tradition and to try it out yourself, you really don’t have to travel that far from the Greater Toronto Area. To give you a few ideas of where to go, here is our guide to the best Southern Ontario ice fishing destinations. Due to its location less than an hour north of the city, Lake Simcoe is one of the most popular ice fishing destinations in Southern Ontario. The lake is home to bass, muskellunge, pike, walleye, perch and, most notably, lake trout. Some of the best lake trout fishing takes place during the winter months, and patient anglers can reel in some monster-sized fish. About the same distance to the east is Port Perry on Lake Scugog. This large, weedy lake is home to smallmouth and largemouth bass as well as muskellunge and panfish. During the winter months, the lake looks like an ice hut shantytown. In fact, local outfitters offer sleeper huts, complete with propane stoves, so you don’t have to leave your lures unattended even if you need to catch up on some Z’s. Heading further east and north of Cobourg is Rice Lake. This large lake has plenty to offer the winter angler, including large and smallmouth bass, muskellunge, northern pike and smaller rock bass and yellow perch. The great thing about Rice Lake is there are numerous access points to reach its frozen shores, so you can pick and choose the best places to drop a line. For those wishing to drive a bit further, opportunities abound to make a prized catch in the Muskoka area. Near Port Carling, smallmouth and largemouth bass, lake trout and walleye can be found in Lake Joseph, while muskellunge and lake trout are the featured catch on Lake Rousseau. The lakes, usually bustling with huge powerboats in the summer months, take on a quieter tone during the winter so you can enjoy a peaceful Southern Ontario ice fishing adventure. Georgian Bay is almost as large as Lake Ontario, and in the Wasaga Beach and Collingwood areas you can drop a line through the ice and expect to find bass, pike, walleye and several species of trout. The best way to find a good spot to drill a hole is to check with the locals, since many of the most inviting looking areas are actually quite shallow. Just a couple hours north, right up the 400 series highway, Lake of Bays is another fantastic Southern Ontario ice fishing destination. Found just outside of Algonquin Park, the lake has healthy populations of large and smallmouth bass as well as lake trout. 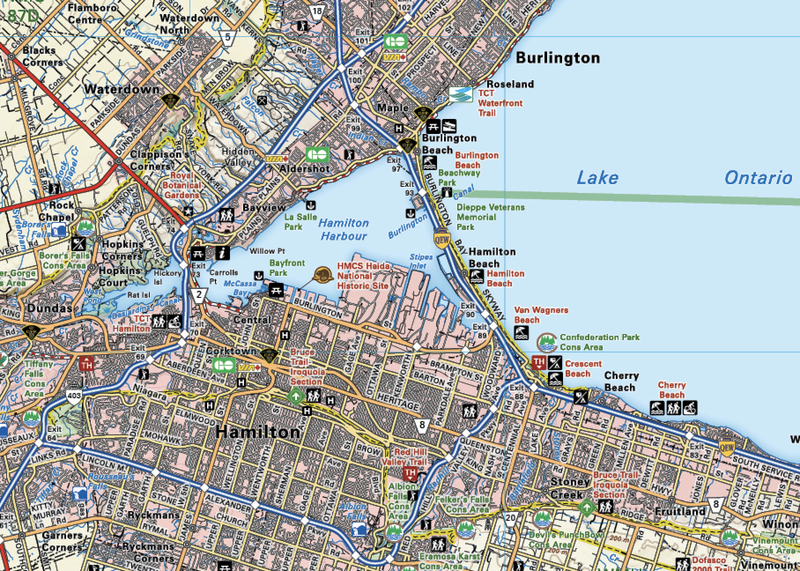 And finally, if you don’t want to venture too far, check out Hamilton Harbour. Take your auger, drill a hole and try for the walleye that have been stocked in this area of Lake Ontario by the Ministry of Natural Resources. However, it’s only catch and release at this point. You can find these and many other Southern Ontario ice fishing destinations in our Southern Ontario Backroad Mapbook, Cottage Country Ontario Backroad Mapbook and Ontario GPS Maps. 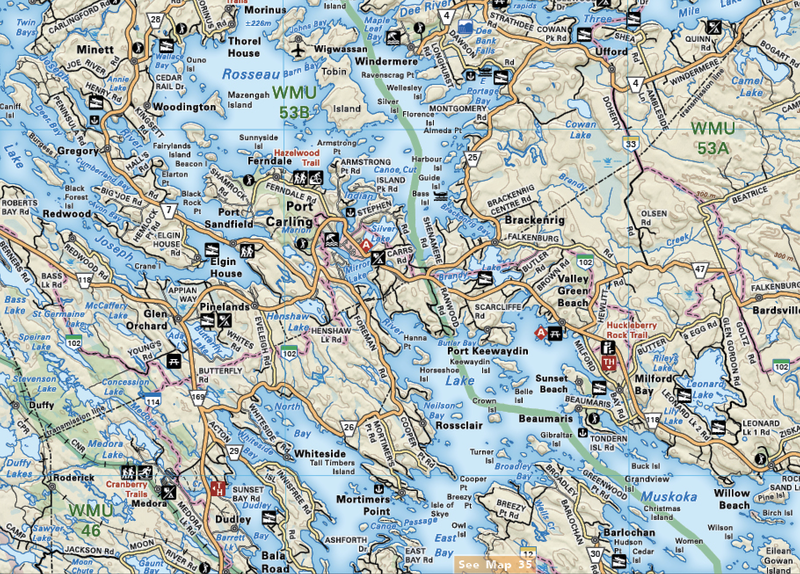 Along with our industry-leading maps, our Mapbooks provide you with detailed information on fishing lakes and rivers including species and stocking information, access, regulations and more. Did we miss your favourite Southern Ontario ice fishing destination? Let us know in the comments below or share your own ice fishing adventures with us on Instagram using #brmblife for a chance to be featured on our feed and win prizes.